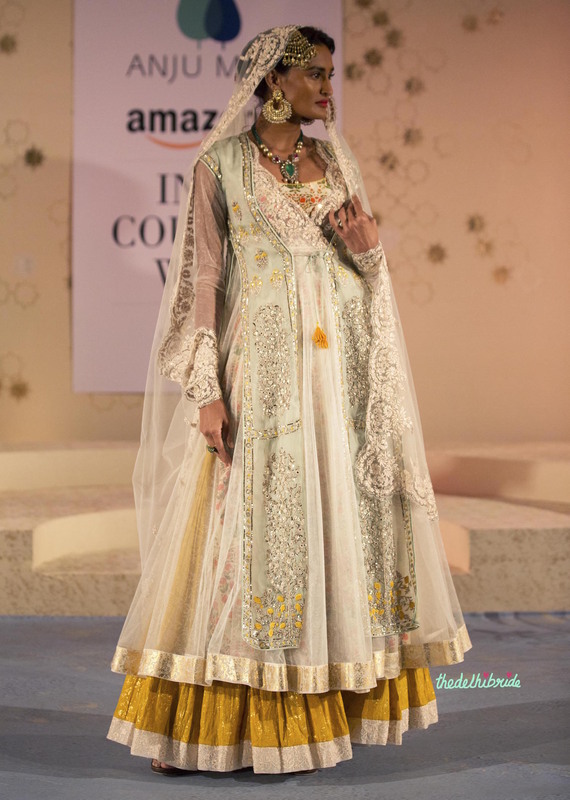 Although I cribbed about the lack of inspiration at Amazon India Couture Week 2015, one day that managed to leave us with some serious bridal wear favourites was Day 3. 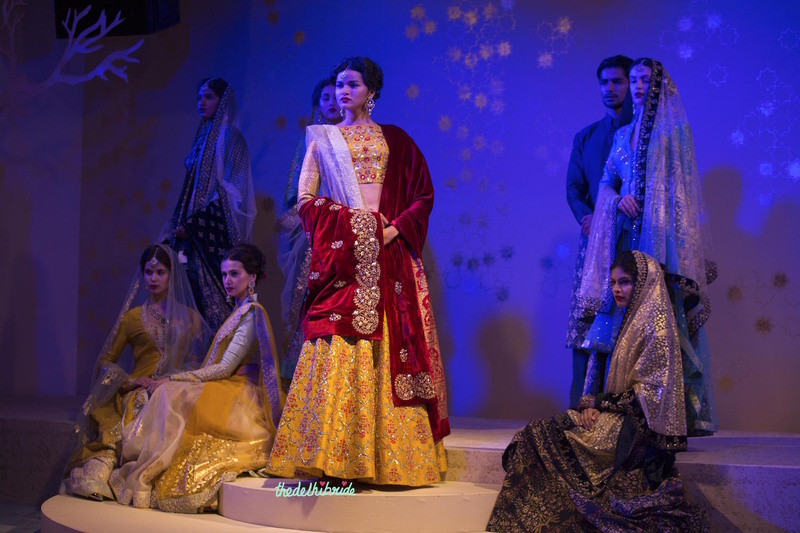 While Monisha Jaising gave us a fresh, young take on bridal wear with her Sailing Bride collection, Varun Bahl put up a grand show with the most elegant trousseau pieces out there. 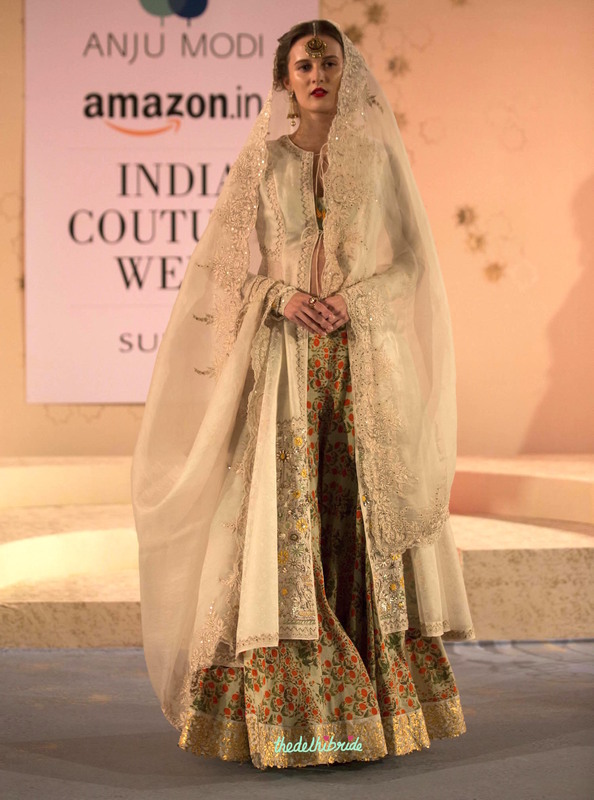 But it was Anju Modi’s couture collection that truly kicked off the exquisite wedding line up on Day 3. 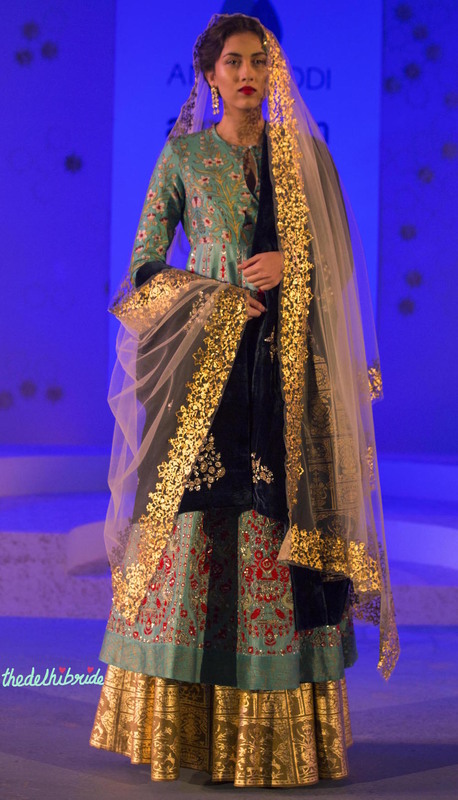 Titled “Kashish”, the collection is inspired by a Persian bride’s wardrobe. Anju Modi continued her signature use of intricately and impeccably embroidered motifs, with the effortless layering only she can pull off. And with bright hues of pinks thrown in with beautiful yellows and soft blues – you can only imagine what a sight it made. Although, you don’t need to leave anything to the imagination. Here are all the images, and our favourites, for you to see. All my three top picks are pale blue pieces. While I am biased towards the colour since it is my favourite shade right now, I love it when pale blue is done right in Indian wear. It’s not a hue you see that often in anarkalis and lehengas, and so when I find one – I make sure I save a picture. What a dainty beauty this anarkali is! The miniature flowers embroidered on the yoke and sleeves are my favourite part. But then my eyes glide down to that beautiful sheer blue fabric sprinkled with sitara embroidery, and I’ve found the perfect anarkali. 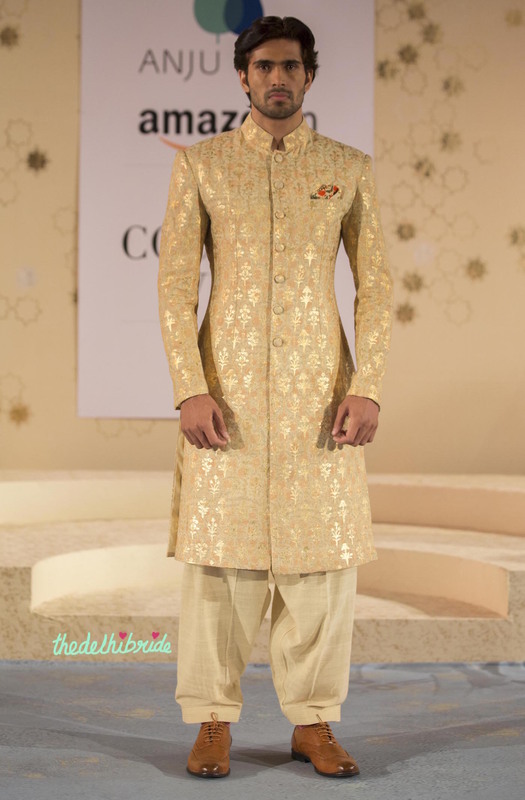 Where to wear: Pair it with a lehenga and wear it on your Reception, or keep it in your trousseau and take it out for any wedding function you have to attend as a guest. I’ve already sung praises of this lehenga in a previous post, where we saw a preview to Anju Modi’s 2015 collection at a Vogue Bridal Studio event. But that doesn’t mean I won’t show it to you again 🙂 I love the intricately embroidered design, and the lovely pairing of colours. 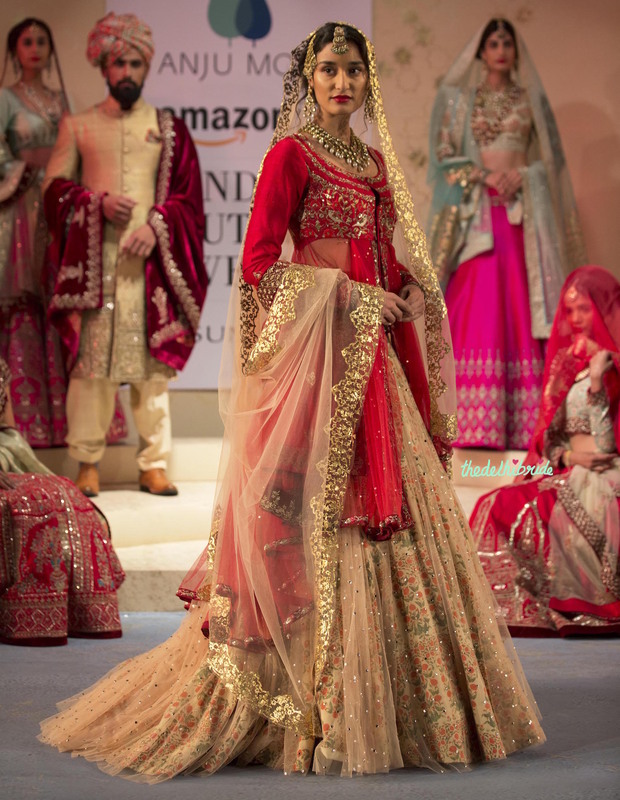 FYI, this lehenga is still in the running for Favourite Wedding Lehenga of 2015. Where to wear: Your Wedding if you’re having a morning ceremony, or your Reception. I love this blouse SO much, I had to give it a spot in the Top Picks. If you follow me on Instagram, you’ve already seen it on my feed. This blouse is an absolute beauty, and I love, love, LOVE it! 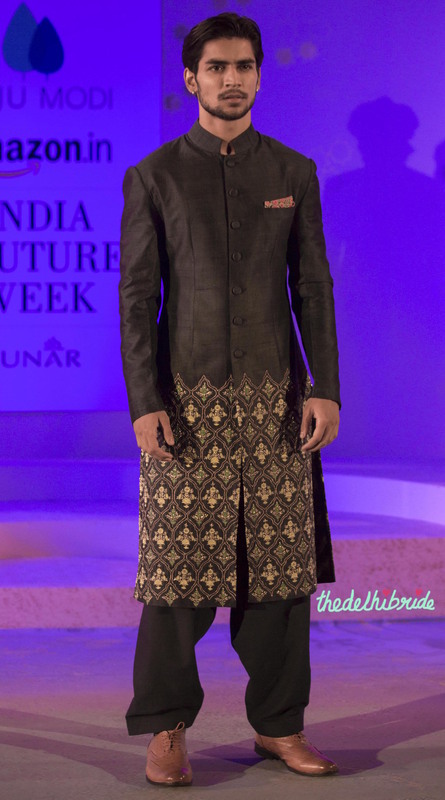 Where to wear: Pair it with any sari, really, that complements the colours. I love this one so much, I’m going to term it a must-have blouse this wedding season, even though I’m well aware one shade and one style of a piece of clothing can never actually be a must-have. Ah, well. I succumb to the powers of fashion journalism today. Bright pout + Soft Hued Outfits = Bridal Perfection. And the jewellery is also worth a mention. The bridal look was neither overly minimalistic, nor overdone – instead, it hit just the right spot in between. 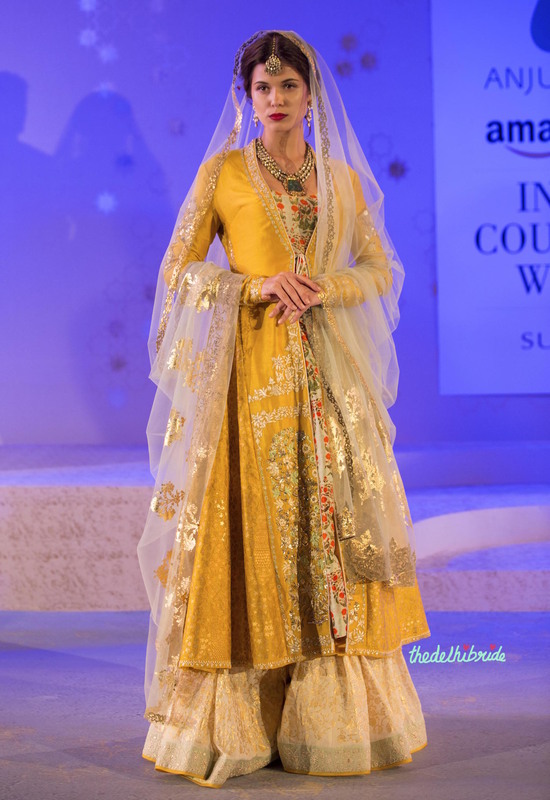 Anju Modi’s Kashish collection portrayed an elegant bride, much like a Persian princess. And true to its name, it left me wanting more. You tell me if that’s a good thing, or not. What did you think of Anju Modi’s pieces this season?